For years, the military has turned to the birds and the bees for inspiration, churning out mechanical hummingbirds and remote-controlled insect cyborgs. Now the Pentagon wants its mini-drones to have hairy wings and bug eyes, too. It’ll help the tiny machines spy on — and creep out — any enemies, military researchers promise. MAVs or Micro Air Vehicles are tiny, hovering bots that have been deployed for battlefield reconnaissance. But they’re still as limited as they are small. MAVs can’t really navigate urban environments or maintain a stable hover when the wind suddenly shifts. ”Get them among buildings or give them something to do near the ground — and they’re helpless,” James Paduano, chief engineer for bio-inspired development projects at Aurora Flight Sciences Research & Development Center, told Danger Room. So the Pentagon just handed out research awards to make bug eye-structures that look out for obstacles and “micro-feather/hair covered membrane wings for a flapping wing MAV” that sense gusts of wind. The goal is to allow these robo-spies to interact with the environment on their own. The research could turn drones like the military’s Wasps into even more effective surveillance machines. Nature will be the engineers’ muse. A project to equip MAVs with hair-like sensors hopes to produce “the flight efficiency and agility of the hawkmoth,” the insect known for its hovering flight patterns. To figure out how MAVs could keep flying smoothly even when the wind pipes up, another group is looking at how hair cells on bees’ bodies sense changes in air flow. 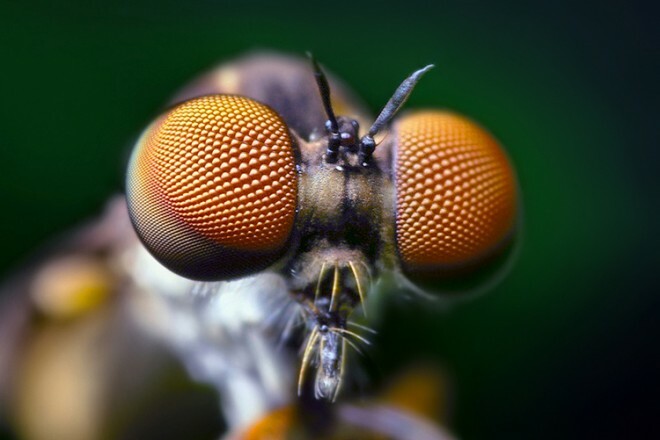 Paduano’s engineering team, with the help of University of Maryland researchers, also wants to give MAVs the kind of crazy compound eyes that insects have. They’re sticking tiny cameras and processors onto a maneuverable aircraft called the “Skate” to replicate what a bug eye does. The cameras will transmit visual cues to an image-processing minicomputer — the kind used in cellphones — which will direct the aircraft to navigate the environment, swerving around corners, if necessary.